Flatten the lamb out and place in a shallow dish. Add the marinade ingredients and mix thoroughly. Cover and refrigerate for an hour. Remove from the marinade and thread metal skewers criss-crossing through the meat to keep it flat. The metal skewer also helps to conduct the heat through the lamb. Cook on a lidded or covered barbecue – not too close to the coals. Turn frequently and cook for about 40 – 50 minutes until the outside is nicely browned and the inside is slightly pink. Alternatively place on a rack in a pre-heated oven 180°c, for about the same time. Take the reserved marinade and bring to the boil and simmer until slightly thickened – about 5 minutes. 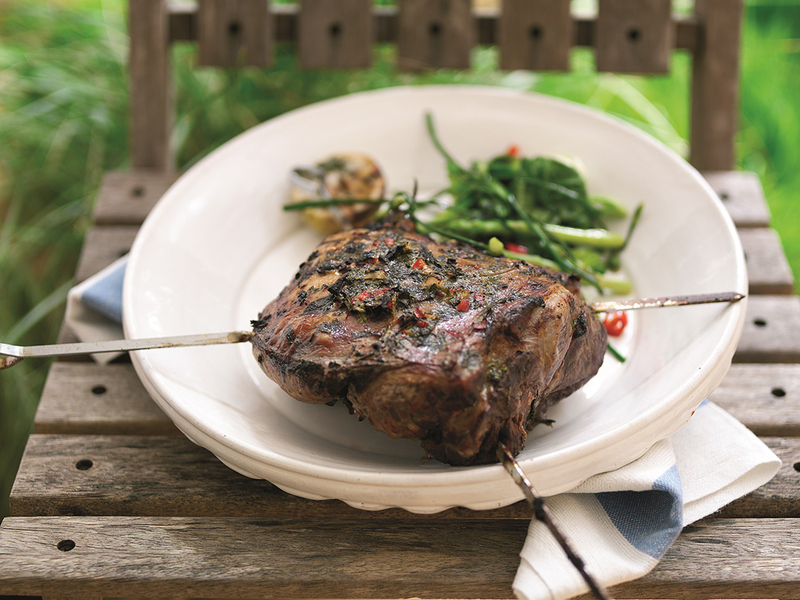 Serve the marinade drizzled over the lamb. Chinese stir fried vegetables make a great accompaniment.